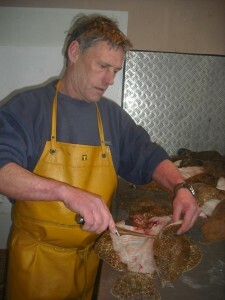 I’m Kevin, I have been a full time fisherman in Jersey since 1974. My catches have varied from crab and lobsters to wet fish and scallops. Jersey has the best cold water fish in the world from our clean waters and I want to share it with you. Recently, it has become more apparent that the general public are demanding better information about the food that they eat. There is a demand for sustainable, fresh, local food. 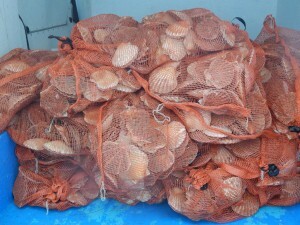 With this in mind, a few years ago I started selling direct to the public and stopped exporting – I concentrate on catching wet fish and scallops and my main emphasis is on fresh, local and sustainable seafood at good prices. My wife and I set up jerseyfreshfish.com and also became members of the Genuine Jersey Products Association. My boat is under 10 metres in length and my fishing trips are all under 24 hours in length. Due to the size of the boat, my fishing gear is lighter than larger boats and consequently this means the seabed damage is minimal. Any fish I catch which are undersize are thrown back alive to grow bigger, so the public can be reassured that the fish they buy from us have been caught in a very sustainable and responsible manner. Although running our own business selling direct to the public is hard work and long hours, the business has expanded and we have a very loyal customer base including some top quality outlets. My aim has always been to show the general public that fresh fish does not need to be a luxury product, but something to enjoy with the added benefit that the customer knows the source and quality of the product. My feedback from customers has been outstanding so far and I hope to build on this. I have been able to introduce not only prime fish i.e. 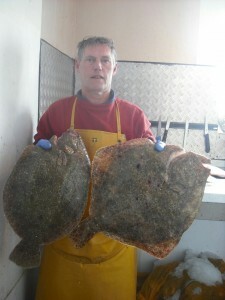 turbot, brill, sole, plaice, skate etc. but also less well known fish such as pouting, pollack, whiting, gurnard, and rock salmon, a very economical and sustainable fish. Our website contains information on the many types of fish we supply along with cooking tips to help you get the best flavour. 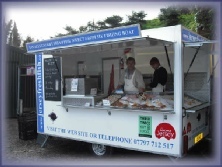 Our main outlet is at Lucas Bros Farm shop at La Haule Hill, where we sell from our trailer every Friday and Saturday from early morning until we have sold out. We also sell our catch from the fish counter at Co-Op St Peter so it’s easy to pick up local fish along with your supermarket shop. Throughout the summer, we can also be found at various markets, including the Farm and Craft Markets at St Aubin and the Royal Square. 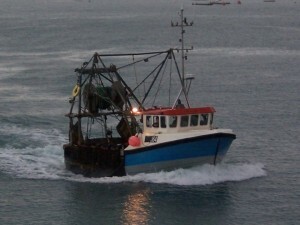 When buying from us the public only receive the freshest seasonal fish caught that week. If our trailer is closed, it is generally due to bad weather or essential maintenance on the boat. Our plans for the future are to further promote the lesser known fish and provide more customers with good value, quality fish with zero food miles. Keep up to date with Kevin by following his Facebook page here: jerseyfreshfish.com or sign up to his popular weekly email to find out about what he’s caught each week.